31st october deals with the aftermath of the assassination of Mrs Indira Gandhi, the prime minister of the country- an event that occurred in the year 1984. The subsequent massacres of the Sikh community that occurred in the capital city Delhi have remained a bitter memory that has forever marred relations between the Sikhs and Hindus, judging from the attempts that are going even now to stoke the embers of separatism in Punjab . One wonders why the film was not titled ‘1984’, since that is the year that most Sikhs invoke when they put forth their grievances. Maybe that title has been taken up earlier by some other film. The one thing that is shown is that news is coming out already in newspapers of the militancy in Punjab that is taking the lives of Hindus at the hands of Sikhs. But the principal character of the film (Vir Das) calls the militants a blot upon the name of the community. 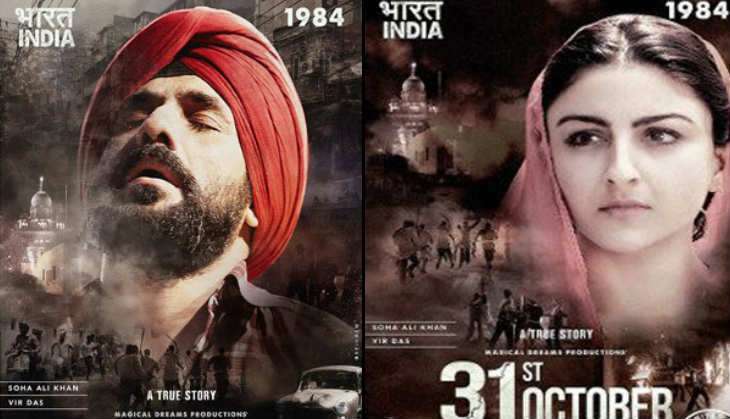 Director Shivaji Lotan Patil and producer Harry Baweja would like to remind us that not all Sikhs were in favour of the Punjab militancy at this point. While this was going on, at the other end of town the bodyguards of Mrs Indira Gandhi were getting ready to take her life. Before that the killer of Mrs Gandhi pays obeisance at a Gurudwara and the words ‘waheguru waheguru’ ring at the same time. Does the director want to say by this that the act has the blessings of Sikh gurus’ tradition? Something that is not clear to me. Once the news spreads of the assassination, attitudes towards Sikhs rapidly change in the nation’s capital. Vir Das finds his loyalty to the nation questioned abrasively by a man in his office and even another who is sympathetic to him asks him to go back home. Later the sympathetic man refuses to help him out when Vir’s family is in danger because he does not want to risk his own life. Mobs which attack Sikhs are given directions to do so by politicians. I could recognise two of them from the trademark goggles of one actor and the distinctive beard of the other actor—H K L Bhagat and Jagdish Tytler. As mayhem breaks out in the city, the movie focuses on the saga of Vir Das and his wife who is played by Soha Ali Khan. Their life is in danger at the hands of rampaging mobs. The one tragic feature that the film shows is that Sikhs with hair which are cut are likely to have their life saved, as the episode of a Canada returned Sikh shows. So Sikhs could have saved their lives only at the cost of forfeiting the main mark of their religion !! The film reminds us through a dialogue by a character that Sikhs had defended the Hindu community on several earlier occasions. But the film honours itself by not blaming the Hindus as a community for the massacre. In fact , it shows some Hindus (played by Deepraj Rana, Lakha Lakhwinder Singh and Vineet Sharma) either risking or laying down their lives to save the life of Vir Das and his family. And the perpetrators of the massacre also back this fact by repeatedly giving warnings to those Hindus who are saving Sikhs that they will not be spared too as they are ‘traitors’. But bad apples do abound, as evidenced by the uncouth and foul mouthed police inspector (played by Nagesh Bhosale) who puts an impediment to saving Vir Das, another police inspector who flatly refuses to help the Canada returned Sikh, a doctor who refuses to treat sick Sikh patients, and a drunkard who pretends to give succour to a Sikh only to call the mob baying for his blood . At the end of it all, the film says that none of the people behind the genocide have been brought to justice. That the government figures for the dead are more than 2000 but independent sources say they are 9000. But it also accepts that many Hindus helped Sikhs survive the massacre and calls on them to help the Sikhs again by backing the cause of bringing the perpetrators to justice. The film does portray the terror that the Sikhs must have felt on that day and in that night by repeatedly showing gangs armed with sharp weapons going on a killing spree and burning Sikh owned establishments by fire. They literally patrol the streets searching for Sikhs to kill. Soha has to disguise herself by putting on sari and red bindi like Hindu women and Vir Das has to hide in the trunk of a car. Acting by everyone is ok but no one puts any spectacular performance. Music and songs are okay and photography is okay too, but nothing special. Colours are dull however. As a person who likes to watch films with politically and especially communal inspired violence, I did find the film interesting. But the film has no new insight to the happenings and the drama does not fully touch your heart; the drama is not high enough in the film. Maybe that is because the film exclusively concentrates on the massacres and has no romantic or emotional story at it’s core.